Introduction: Coronary artery bypass grafting is one of the most common cardiac surgeries in the United States with an estimated 400,000 procedures annually. These procedures tend to require five to seven days of hospitalization. It is well-established that reduced time of mechanical ventilation leads to less sedation requirement, lower rate of pneumonia and DVT as well as a shorter ICU stay. The goal of this study is to use patient’s arterial PaO2/FiO2 ratio post-operatively to predict time to extubation after coronary arterial bypass grafting. Methods: A retrospective study involving analysis of 74 coronary artery bypass graft patients. 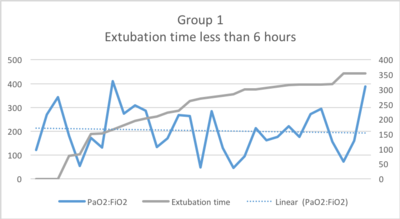 We created 3 groups based on extubation time, patients extubated within 6 hours, 6 to 12 hours and greater than 12 hours after admission to the coronary care unit following coronary artery bypass grafting. Initial post-operative arterial blood gas samples were collected from intubated patients and PaO2/FiO2 ratio was measured as a representative for oxygenation status. Time to extubation was recorded in minutes for each patient and a univariate regression analysis was performed. 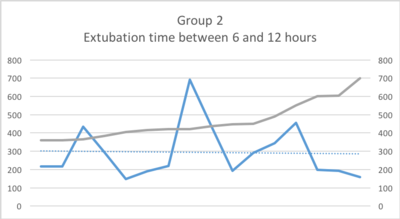 Results: Patients were separated into groups based on time to extubation with the following breakdown: Group 1 (extubation in less than 6 hours) n=31, Group 2 (extubation between 6 and 12 hours) n=16, Group 3 (extubation greater than 12 hours) n=27. Across all groups, it was found that for every 1 unit increase in oxygenation status, there was a decrease in extubation time. For group 1, there was a 0.11 min decrease, with a p-value of 0.59. Group 2 patients had a 0.14 minute decrease, with a p-value of 0.46. Group 3 patients had a 5.29 minute decrease, with a p-value of 0.41. Conclusion: In the critical care setting, ventilator time is a major factor for intensive care unit stay, and as it is prolonged, becomes an increasing risk factor for nosocomial infection. 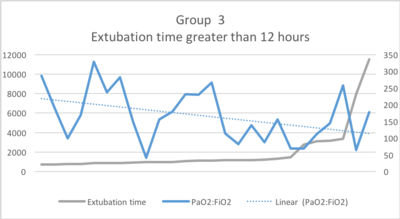 Although the PaO2:FiO2 ratio has a weakly correlated time to extubation, this lack of clear correlation could lead to further investigation about the long-term effects of hyperoxia post-CABG.